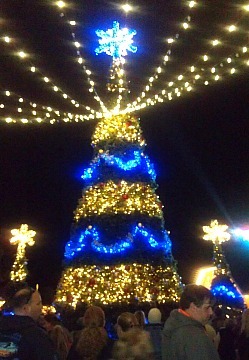 Celebrate Christmas Town at Busch Gardens Williamsburg! Christmas Town hours and operating schedule for 2018 - see below. Snow, Santa, shows...and roller coasters? Sounds like just what the holidays ordered, and that's what you get at this winter wonderland of excitement for the whole family. The snow may be fake (or not), but the fun is real at this holiday attraction. New for 2018: The park has announced that they are increasing the number of lights from 8 million to 10 million. Expect to see more on and around the path of the train, turning it into more of an actual ride rather than just a form of transport around the park. No word yet on prices (see below), but free Christmas Town admission is now included in annual park membership, so that's one good reason to consider buying or renewing your membership. Once available to Annual Pass Members only, but now available to all, this ticket lets you pay for one visit, then make unlimited visits all winter season long. This ticket does NOT include parking. 2018 Williamsburg Christmas Bounce Ticket - Adults (13 and up) - $82; Kids ages 6-12 - $67; Kids 5 and under are free (you must purchase an adult ticket to be eligible for a free infant ticket). This ticket provides admission for three consecutive days to Christmas Town, as well as to Colonial Williamsburg's Historic Area. It also includes parking each day. 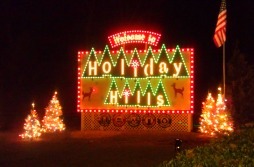 Annual Members: All passes now include unlimited admission to Christmas Town! In addition, members can purchase tickets for up to 6 friends at 50% off. Buy your single-day ticket by Nov. 11 and you can snag what is quite possibly the best price of the season: $20-$30 depending on what date you choose. Of course, you'll have to go to their website and be willing to lock yourself into a date. That's a substantial savings if you're willing to lock yourself into a date in advance (although beware of these drawbacks I'll explain below). Advance tickets are available at the Busch Gardens' website and prices will depend on the popularity of the day. Weekday prices are $20 during the flash sale, but may rise to $30 or even more after the sale. Weekends are always higher. Generally, your cheapest time to visit is going to be Mondays through Wednesdays. So if you pick a less popular date, you could end up with a really great discount on your tickets this year. I'm planning on buying my tickets in advance for the middle of the week before Christmas. But I DO recognize that I'm running a major risk: the weather. Yes, the weather that time of year can be unpredictable-- either 50's or snow and windy or sleet-- but by buying in advance I'll be stuck with the weather conditions that day. Just keep that in mind when taking advantage of the advance purchase deal. Until current promo codes start coming out, I'm leaving up 2017 info to give you an idea of what to expect. EXPIRED - Once again, Dunkin Donuts is offering a promo code worth $10 off tickets when you use the code BGWDD online. So this promo code may only be worth it if you want to keep your date of visit flexible. On the plus side, however, the promo code is good for up to six tickets. As for military discounts, and first responder discounts, here's the bummer: the "Here's to the Heroes" program which provides free admission to active military and their families during the regular season is not valid during the winter season. Note that neither the Single Day Admission Ticket nor the Fun Card or Flex Ticket include parking-- that's extra, and it'll cost you $15 per car per day. One tip: If you CAN park in one of the lots outside the park and you're planning to leave at or close to closing time, you'll be able to get on your way much faster. Recently, I parked in the Italy section of parking, while my sister parked outside the park. She got home a full 15 minutes earlier than me because she wasn't fighting traffic getting out of the parking lot! Also, you MAY be able to get parking at times. Here's how: On certain dates when the park has been full, they've opened the lot ACROSS the street from the Anheuser-Busch building (which is located further west on Route 199, the road you take if you're heading to the park from Williamsburg and not on I-64). When they do open this lot (you'll know if a police car is there directing traffic) they you can turn into this lot and park and use the free shuttle into the park. There is NO CHARGE for this parking! My sister has been able to get free parking twice this way, but the catch is that it is only open when the park is super busy, so on our last visit to Christmas Town before this Christmas, it was closed. But keep it in mind for the busier summer season! Quick Queue, Ways to Save, Best Photo Spots, and the Attraction to Avoid! 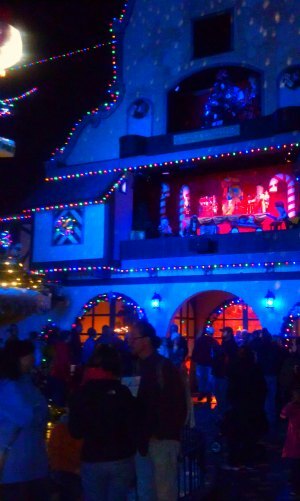 Busch Gardens Williamsburg also offers a Christmas Town Quick Queue Pass (or actually, three different passes which give you priority seating at shows, and let you jump to the front of the line on select rides. For my tips for Saving Money on Food...Best photo spots...What to Wear (bet this won't occur to you! ), and the attraction you should SKIP unless there's no line, click here. Want to dine with Santa or Rudolf? For an extra fee of $31 for adults, and $21 for kids ages 3-9, you can sign up to have delicious buffet to Dine with Santa at Castle O’Sullivan in the Ireland section of the park. Reservations are required. To make dine with Santa reservations, go to the BGW website. This year, they're also offering a Dine with Rudolf option at Dasher's Diner in the Holiday Hills section. For $29 for adults and $19 for kids, you can have access to a carving bar and pasta and salad station, priority access to Rudolf's Winter Wonderland, and access to 6 photo op areas. 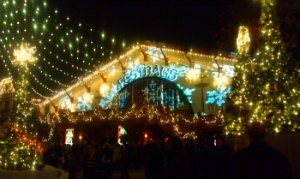 Finally, they also have a Tastes of Christmas Town at Das Festhaus which gives you reserved seating at the "Deck the Halls" show and an all-you-can-eat buffet dinner. It runs $36 for adults and $17 for kids, but is only available dates, so be sure to order tickets online. Never been to Busch Gardens Williamsburg before? Let me take you on a tour of the park, give you the scoop on what you'll find in each "country," and share our secrets for maximizing your visit!